I have very special memories of Beaconsfield Road, Tottenham for at number 15 was the small private school called Nortons School. I started school there when I was 5 years old in 1929 and left there when I reached 14 years old and started work in 1938. My two older brothers, one older sister and also my younger brother and sister all went to the same school too. We could have left school there earlier had we wished and gone on to the Tottenham County School, which was just two minutes from our home in Clyde Road, or we could have gone to the Tottenham Grammar School in Tottenham High Road. But we were all very happy in our small private school. We had approx fifty pupils in total ranging from 5years to 14 years old. My dear Mother was determined to get us all to this little school that was just an ordinary terraced house exactly as it is to this very day. During a recent visit back there, I had my photograph taken outside the house and I told the people standing nearby that it was once a school and explained that Mrs Norton was the Headmistress and she also had two married daughters who used to teach there. They used to do the Piano lessons and in the evenings there were singing lessons and tap-dancing lessons too. course was a lot of money in the thirties. My Father worked in a butchers shop in West Green Road. I can remember all the names of the shops in West Green Road quite clearly, particularly Spencers the butchers where my Father worked, just about two shops from Heward & Dean and next door was a greengrocer. Whilst at school we would all go home for our dinner at number 25 Clyde Road, just a few houses past the Tottenham Council depot by the railway bridge. So we each walked up and down Beaconsfield Road four times a day for nine years (From 5 to 14 years). This was besides the hundreds of times we walked down there to do shopping in West Green Road, when we had all the wonderful stalls there- A great market ! My Father left the butchers in West Green Road just before the war started. With six of us children to feed, my parents had a hard time and like all the families around us we were quite poor. Near to us in Clyde Road there was a family of 8 children  two more families of 6 children  and some families of 4 children. We only had one family anywhere near us with an only-child and they of course were thought to be quite well off. They even sent their washing to the laundry, which was further up Clyde Road. My Mother, like all the others, had a very hard day on the traditional Monday wash-day. Before going to work, my Father would light the fire under the old brick copper in the scullery to get the water hot for my Mother so that she could start on her pile of washing after we had all gone to school. The washing had to be stirred all the time by the old wooden washing tongs and washing dolly, I can then remember getting home from school (We left school each day at 3:30 pm) and I would then go out into our little back yard where we had our old washing mangle. As Mum held the wet washing, I would turn the handle of the old mangle and putting the wet washing through the rollers two or three times in order to get as much water out as possible. We would then fold all the washing for Mum to hang out on the clothes line in our little back yard the following day both hoping and praying for a nice dry day and the wind too to try and get it all dry. Sometimes it would take between two to three days to actually get it all dry. Then of course we had the ironing ! We had no ironing board and it had to be done on our small wooden kitchen table. There were no electric irons just sad irons that had to be heated on the gas stove. As you can imagine this was all very hard work and had to be repeated every week. My family also had a very difficult time somewhile before the war started. My Father had to leave the butchers shop of Spencers in West Green Road because the company were closing down. My Father was then out of work for over eighteen months. It was quite impossible to get a job in the trade if you were over forty years old. My Father was about 52 years old ! I remember he used to buy the Meat Trades Journal regularly looking for employment, He also actually travelled every day by tram to Smithfield meat market and left home before six-o-clock each morning. He would stand under the clock at Smithfield market, as this was where unemployed butchers used to stand every morning hoping to get a days or even half a days work. My Father finally found a job in Blackfen, which was near Sidcup in Kent. For 5 mornings every week he left home in Tottenham at 5:00 am and travelled all that way and worked until 1:00 pm each day. Then of course he had the very long and slow journey home. This was the job he had when the war actually started and each day he travelled all that way. As children we played in the street after school every day. We would all play in Carlton Road and of course we also enjoyed so much the Tottenham Green just at the top of the road. Not one of us ever ever had a holiday of course since no one could afford a holiday of any kind at all. Everyone in the street would look forward to perhaps one wonderful day by train to Southend-on-Sea from South Tottenham station each year. We would get so excited weeks before hand while Mum & Dad saved just a few shillings. We would take all our food with us and bottles of lemonade (Just Tuppence a bottle), and all we would buy there were a few sticks of one penny rock to bring home for our friends. Oh the wonder of it all ! Clyde Road was a nice place to live before the war. I am referring to our short end of Clyde Road that ran from the corner of the Town Hall approach road up to the start of Clyde Circus. We had the large Brewery Bottling factory on the corner of Clyde Road and the Town Hall approach road. There was a large entrance to the brewery on the corner, where all the lorries arrived carrying hundreds of empty crates, and further along Clyde Road there was another entrance where the loaded lorries used to leave. Adjoining the brewery was a row of eight terraced houses where we lived. These eight houses were called Lincoln Terrace, Clyde Road and were numbered No 1 to No 8 and we lived at number 8. There were then another eight houses, which were different in style to ours and a little newer too. Our eight houses were marked above with 1901 but the other eight houses had no date above. 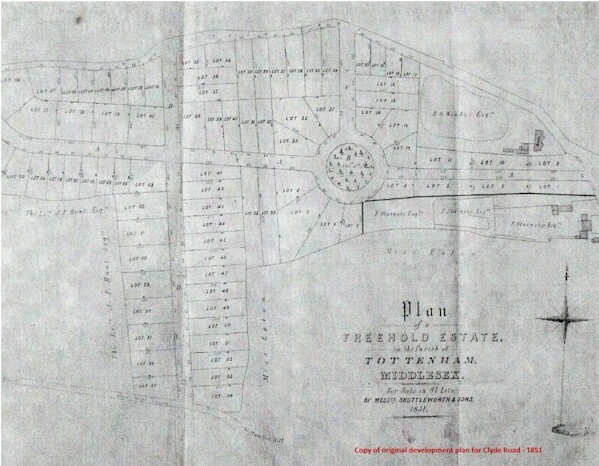 The second row of houses were then called  Beechly Villas, Clyde Road and were also numbered No 1 to No 8. My Grandparents actually lived in number 3 Beechly Villas, which was just 3 houses along from our house. This second row of houses finished at the Tottenham Central Depot Store, which was next to the railway bridge. After the railway bridge we had a row of shops up to the corner of Beaconsfield Road and the Clyde Circus. The first shop past the railway bridge was a second-hand shop of many odd items. Next door was a nice small Fruit-Shop then the Newsagents and Sweetshop followed by a Fried Fish-Shop then a small Cycle-Shop and finally, on the corner of Beaconsfield Road, was Carvers the Off-Licence. The other side of Clyde Road at our end were all terraced houses up to the corner of Carlton Road, which was the short road that ran through to Philip Lane. On the left corner of Carlton Road and Clyde Road was a nice Grocers Shop where we done nearly all of our shopping. Next door to that was a small Wool-Shop, then a Sweetshop and next door to that was a small Radio-Shop where they used to charge Accumulators and sell Batteries etc. The last shop was Tremains Builders and it had a small shop too for building materials. Then of course you reached the railway bridge again and, on the other side of the bridge, were two beautiful houses, which were owned by the undertakers Seward & Sons. They had an estate there going through into Philip Lane and they owned all the land from the bridge in Clyde Road to the start of Clyde Circus. One of the lovely houses is still there of course and still looks exactly the same on the outside but has now apparently been converted into flats. I cannot remember when the house where we lived had the house numbers changed, but instead of Lincoln Terrace and Beechly Villas the whole 16 houses were re-numbered and our number 8 Lincoln Terrace became number 25 Clyde Road. My grandparents house was also re-numbered at the same time. I think this change took place when Tottenham was made a Borough in about 1934. The only reason of course that we had to move from Clyde Road in 1970 was because the whole of our end of Clyde Road received a compulsory purchase order from the local council, because they wanted to demolish the whole section in order to build the new Leisure Centre which is there now. Tottenham was a really wonderful place with plenty of shops and plenty of work too. When each of we six children reached the age of fourteen, we all started out to work, and were all fortunate to find work immediately. My eldest brother worked for a firm called Millers who were manufacturers of knitting needles. My eldest sister worked there too on the labelling and packing section. Another brother went to work at Flataus the shoe manufacturers who were located just off Northumberland Park. My younger sister worked for Savory & Moore in Lawrence Road and my younger brother went to Bergs the Tailors near Bruce Grove. I worked for E.C Ambridge (Ironmongers  Tools Radio  Hardware etc ) and we stocked over 100,000 lines. We were well known throughout London and we had a famous motto displayed in neon lights above the shop in Tottenham High Road. Our motto was Everything from a tinned tack to a steam engine. We were situated next door to Easterns Furniture shop and opposite Endeans the leather shop. It truly was a wonderful place to work and to learn ! The boss was a very clever man and he treated me almost like a son. The wages for a fourteen year old was between 12 Shillings and 14 Shillings a week to start. My boss actually paid me 16 shillings and I was delighted. As each of us children reached 14 years old and started work, we were each of us allowed 2/6d (Two Shillings and sixpence) for our pocket money and, as we increased our wages, then we would get more. My home life with all my family was just wonderful and on a Sunday we would sit down to a beautiful roast dinner. All the family were together, my Mother, Father, brothers and sisters and my grandparents too. They would come into us every Sunday as they were only three houses away. They were my Mothers parents and my Mother was an only child. We used to play various card games together and had wonderful times. We had a small best room that everyone called the Parlour. None of us were allowed in the Parlour except on a Sunday, so it was a special day. We also had an old Gramophone too in the Parlour and some very old records that my Dad would play each Sunday. When we all started work we used to buy records at sixpence each from Woolworths to play on our old Gramophone and have a sing song together. Christmas times were simply wonderful with all the ten of us together. Nothing could ever replace these days. Just happy happy days and wonderful memories that money just couldnt buy and one could never find the likes today ! My Grandfather taught us all to play Chess and so many many lovely card games too. When playing cards we always used to have a gamble too since we used to gamble with Nuts ! My Grandfather was always the Banker and he used to have a box full of Spanish Nuts and we would use these like gambling chips. My Grandfather would sell the nuts to us at 10 for One Penny and we would buy between Twenty and Thirty nuts each. We would play together at weekends and of course throughout the whole of Christmas. We would play Pontoon, Brag, Poker and a game called Kings. Then at the end of a weekend or Christmas we would then cash in to the banker all our nuts and of course get back at the same rate we had bought for - One Penny for 10 nuts. If we run out of nuts we would simply buy some more from the Banker. Sometimes we would buy about Ten Pennyworth each to start (100 Nuts) so of course there were hundreds of nuts in use all the time. It was all great fun and of course no one ever lost more than a few pennies at the end of playing. We had so much pleasure from such simple things and simple games that we could all play together. Unfortunately of course these carefree days were to come to an end. When we started the year of 1938, which was just as I left school and started my first job, the crisis and threat of War had started. We were told to prepare for having Gas Masks issued to everyone and plans for Air-Raid Shelters to be built in our back gardens and seeing Barrage Balloons in the sky. So as we started 1939 we all knew it was going to be a very bad year. Our family was later to break up with Military service soon to come and my young brother and sister being evacuated to the country. This was to mark the beginning of years of worry, sadness and separation. In fact it was not until 1948 that my whole family were once again completely together again. Just twelve months later the air-raids began to start and got worse every day until the final dreadful day, our very worst day, when they bombed and burnt out the London docks. What a dreadful, dreadful night we had in London. My father had left home as usual at 5:00am on the Saturday morning for his job in Sidcup and was just starting back for home when this terrible air-raid started. My Father actually got as far as the Lewisham tram depot and the bombings and fires were so bad that all the trams went into the depot and could not go any further. My father tried all ways to get home (All the family were in our Anderson shelter in our back yard in Tottenham) and he eventually arrived home at 3:00 pm on Sunday afternoon. There was so much damage in South London that nothing could move very far anywhere. That night was my Fathers very last journey to Sidcup ! Amazingly, just twelve months after the war started, so many men were being called up for the services that work then became available. In fact they were most anxious to find staff over call-up age and my Father actually got a job with Dyson the butchers in Tottenham High Road. It was just a short walk from home and he stayed there throughout the rest of the war, and actually stayed with Dysons until he was seventy years old despite the fact he couldnt get a job over forty years old before the war. The shops realised that experience was what really mattered  Not Age ! It goes without saying that all of these so very happy memories remain with me still to this day and will do so forever. I am now 88 years old and together with my wife of 60 years (She is now 80 years old) we both pray for a few more happy years together ! 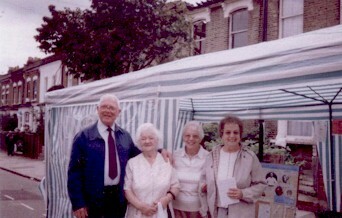 During a visit back to Beaconsfield Road in 2005, Stan had a photograph taken with some local residents and made the following comments  Ive enclosed the photo of those two lovely ladies from Beaconsfield Road. At the time one was 83 and the other was 85 ! It was so nice to meet them and be able to talk about my schooldays in Beaconsfield Road. I was also delighted to receive the photo copy of the back gardens in Beaconsfield Road. It brought back so many many memories of my lovely school ! 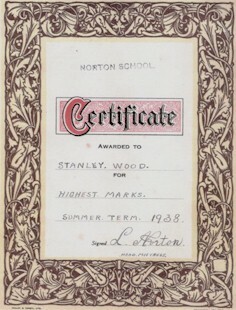 STAN WOOD HAS WRITTEN A NUMBER OF STORIES FOR US INCLUDING HIS WORK EXPERIENCE AT BOTH E.C AMBRIDGE and BROADWAY NANKERVILL BOTH IN TOTTENHAM HIGH ROAD BOTH SUPPLIES O THE BUILDING AND HOME IMPROVEMENTS. TRADE. HE HAS ALSO WRITTEN OF HIS WARTIME EXPERIENCE IN THE ARMY.